Recruiting workers with disabilities in Philadelphia and elsewhere goes beyond regulatory compliance; it’s a skill and expertise essential to all businesses wanting to stay competitive. We know because we’ve advised companies for 25 years on the best methodologies, techniques and current requirements. The Sierra Group, Inc. is a national group of recruitment consultants with a mission of reversing the high unemployment rate for people with disabilities in America. The Sierra Group offers an array of recruiting, consultation and training services designed to assist corporations in their: “bring to work, stay at work and return to work” efforts. Focusing on diverse hiring, retention and accommodation practices, Sierra Group has three divisions: Candidate Sourcing, Vocational Rehabilitation, and Workforce Strategy, thereby serving needs of businesses, job seekers with disabilities and their service providers across the nation. Our immersion in the field of disability and accommodation, allows us to strive to generate deep insight into what drives value creation and competitive advantage in our clients' businesses and the economy as a whole. Once these insights are uncovered, we work closely with clients to convert them into strategies, whose implementation will have a substantial positive and measurable impact on performance. Delivering impact earns the trust that is the foundation of lasting relationships. These relationships then serve as the forum for still deeper insights and more significant impact. By thinking "integrated performance" we reduce discomfort, improve accessibility and help to create systems for optimal employee interactions. The Sierra Group, an award winning, certified women's business enterprise has been serving individuals, governmental organizations, agencies and corporations since 1991. 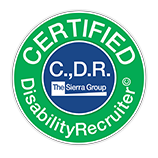 Candidate Sourcing Division: As a national sourcing agent, Sierra Group will locate and submit candidates with disabilities and veterans with disabilities in response to our customer's directive. The Internet will never replace personal contact, therefore, as we work to bring people with disabilities to the hiring process, personal contact is our business. Our staff understands the laws and practical accommodation side of this field of customized recruiting. Cost effective protocols have led to our award-winning model. Vocational Rehabilitation Division: Sierra's certified vocational rehabilitation counselors round out our team of experts in the areas of rehabilitation engineering and business to deliver vocational services for people of all ages and all disabilities. Sierra recruitment consultants and CRCs work closely with state and Federal programs as well as by private disability insurance carriers. Workforce Strategy Consulting & Training Division: Using the principles of appreciative inquiry, The Sierra Group's workforce strategy division offers an array of vocational training and consulting products that will analyze and prepare your company to expand your existing diversity plans. Our consultants use everything from ergonomics to compliance to metrics that measure and benchmark: bring to work, stay at work and return to work initiatives. Sierra Group's Workforce Strategy consultants serve companies through an array of consultation, vocational training and planning services. Workforce Strategy Services are available as part of a Candidate Sourcing package, or a la carte. Please note that customization is our standard. The disabled worker advocates at The Sierra Group stand for reversing the rate of unemployment for individuals with disabling conditions in America. NOTE: This site uses Adobe Acrobat PDF and MS Word document formats. If you need help opening any of these file formats, please go to our accessibility page. Janet Fiore, Chairman of the Board, The Sierra Group Foundation to present First Annual ONE MORE WAY award in Washington, DC on Thursday February 23rd! On October 21st, The Philadelphia Mayor's Commission on People with Disabilities recognized Janet Fiore, CEO of The Sierra Group, with an Access Achievement Award for her work and dedication to people and job seekers with disabilities. Video of Janet Fiore's acceptance speech at the Philadelphia Mayor's Commission Access Achievement Award on October 21, 2011. U.S. Census Bureau released a new report entitled "Americans With Disabilities: 2010"
The U.S. Census Bureau released a new report entitled "Americans With Disabilities: 2010," which states that 56.7 million Americans or 1 in 5, has a disability, with more than half of these individuals reporting the disability as significant. Included in the findings was that between 2005 and 2010, the number of individuals with disabilities increased at the same rate as the general population. Read the "Americans With Disabilities: 2010 " in PDF format. 2009 Disability Status Reports for the US, all 50 states, Washington DC, and Puerto Rico (pdf & accessible HTML versions). Spanish language versions of all 53 Disability Status Reports for 2008 and 2009. Enhanced interactive disability statistics search tool now includes both 2008 and 2009 ACS estimates as well as 2010 CPS work limitation disability estimates. "The EEOC's final regulations implementing the ADA Amendments Act (ADAAA) were published in the March 25, 2011 Federal Register. They become effective May 24, 2011. The major focus of the regulations is the definition of a disability." 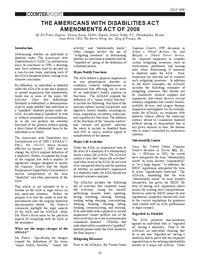 Read the full article from EHS & Safety News America,EEOC Publishes ADAAA Final Regulations – Effective May 24, 2011. ADA Amendments Act - What you NEED to know! READ this article by leading experts, Janet Fiore, CEO & Jill Fisher, Esq. This published article is a quick reference for any hiring manager, human resource or rehabilitation professional who needs a clear, factual update on the changes to this important piece of civil rights legislation. Fiore and Fisher consult and speak on this topic locally, regionally and nationally. For more information on a presentation or consultation contact info@thesierragroup.com. Revised regulations implementing the Americans with Disabilities Act (ADA) take effect on March 15, 2011. The regulations for ADA compliance apply to the activities of more than 80,000 units of state and local government and more than seven million places of public accommodation, including stores, restaurants, museums, sporting arenas, movie theaters, doctors’ and dentists’ offices, hotels, jails and prisons, polling places and emergency preparedness shelters. The U.S. Equal Employment Opportunity Commission’s (EEOC) final regulations to implement the ADA Amendments Act (ADAAA) have been released. Like the law they implement, the regulations simplify the determination of who has a “disability” and will make it easier for people to establish that they are protected by the Americans with Disabilities Act (ADA). EEOC has several fact sheets that explain the ADAAA, including Questions and Answers on the Final Rule Implementing the ADA Amendments Act of 2008 and Questions and Answers for Small Businesses: The Final Rule Implementing the ADA Amendments Act of 2008. The ADAAA sent the message to the American people that individuals with disabilities must be full and equal members of our society. With the release of the EEOC’s regulations, employers across the country will have a clear set of guidelines and rules of the road to ensure equality for Americans with disabilities. This will help ensure civil rights protection for people with “invisible disabilities.” Moreover, the EEOC’s regulations restore the original intent of Congress to cover many disabilities that had been excluded by the courts such as multiple sclerosis, post-traumatic stress disorder, epilepsy, diabetes and many others, meaning that more people will be able to reach for the American dream. Approximately 1 out of every 6 Americans lives with a disability. And millions more have a family member or friend who lives with a disability. Thanks to a bipartisan spirit, with these EEOC regulations, millions of people will be able to successfully put their American work ethic to use helping our businesses, our governments and our schools out-innovate, out-educate and out-build the global competition to win the future. The USBLN® is pleased to announce that Robert "Bobby" Silverstein, a principal with the Washington, D.C. law firm Powers Pyles Sutter & Verville, is available to provide consultations on the employment provisions of the final regulation implementing the ADA Amendments Act of 2008. In addition to his law practice, he also serves as director of the Center for the Study and Advancement of Disability Policy. Prior to joining the law firm, Mr. Silverstein spent over ten years on Capitol Hill where he was staff director and chief counsel to the U.S. Senate Subcommittee on Disability Policy where he was the behind-the-scenes architect of 20 bills enacted into law including the Americans with Disabilities Act. Mr. Silverstein prepared the attached three documents for the USBLN® members. These highly informative publications include an "Overview of the EEOC Final Regulation Implementing the ADA Amendments Act of 2008," a detailed "Description and Analysis of EEOC's Final Regulation Implementing the ADA Amendments Act of 2008," and "Resource Materials for the ADA Amendments Act of 2008" that includes several important links. ADA Amendments Act resource material - MS Word. Description and Analysis of EEOC's final regulations implementation of the ADA Amendments Act of 2008 - MS Word. The Sierra Group Inc. would like to recognize our friends at AI Squared as a new sponsor of The Sierra Group Academy's Newsletter. The Sierra Group on the move – we've relocated! Interested in community service or volunteer work? Please contact The Sierra Group via e-mail at info@thesierragroup.com or by phone at 1.800.973.7687.